A clone is essentially an identical twin born at a different time, so it should look exactly the same as the original, right? Well, with cats, this actually isn’t true. Genetics can play a surprising twist where cats who share the exact same identical genes can still end up looking different. Of course, cloning your favorite kitty isn’t an option that’s commonly available to most of us. But the phenomenon seen in cloned cats also explains why identical twin cats can end up with different colored coats. Back in 2001, Texas A&M University introduced the very first cloned cat to the world. Her name was CC, short for Copy Cat. But there was one big mystery surrounding CC. Her clone mother, Rainbow, was a calico cat. CC, meanwhile, was a “tiger tabby.” Both cats had lots of white, but Rainbow’s white was mixed with orange and black. CC’s white was mixed with grey and black. The researchers were so confused that they sent the samples for independent testing and it was confirmed that CC and Rainbow were, indeed, genetically identical. The color orange is randomly activated and deactivated in cats. This means that in some skin clusters, if the gene for orange color is activated, the cat will have orange patches. If it’s deactivated, those patches will be black instead. White spotting in cats also has a random factor. The cells in a cat’s skin that produce pigment, called melanocytes, migrate across a cat’s skin during fetal development. The cells start at the back and move toward the belly. If these pigment cells start moving later during fetal development, they won’t reach the belly and will leave big patches of white fur on the belly and legs. This can also be random, so even a tuxedo cat’s identical clone might have a different pattern of black and white in her fur. These random coat coloring results aren’t limited to cloned cats. The same thing can happen with identical twin cats. Remember, an identical twin cat isn’t the same as cats born in the same litter. 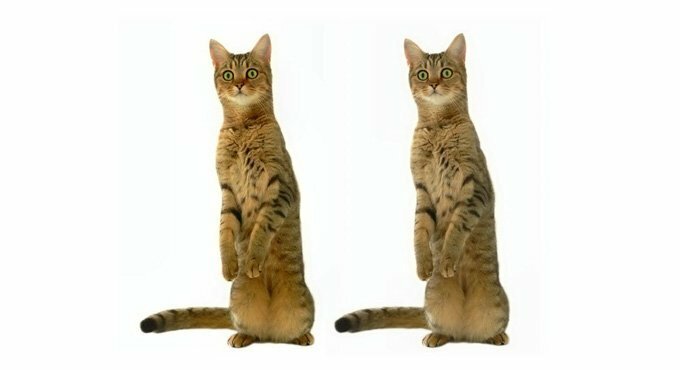 Cats born in the same litter grew in the same womb, but they aren’t identical twins unless they came from one fertilized egg that split in two. But in those cases, just like with cloned cats, they may not end up looking identical at all. If you’ve ever considered cloning your cat, you should know that Kitty #2 could be very different from Kitty #1. However, experts disagree on the role that genetics plays in personality. Some say that genetics can make a huge determination in whether a cat is bold, shy, friendly, or aggressive. Others say that it’s all about how a kitten is raised, whether she’s malnourished, and if she’s handled a lot from a very young age. If you want a cat with a similar look and personality as your current cat, a much cheaper option would be to adopt a homeless kitten who already looks similar. Handle her a lot from a young age and raise her alongside your current cat, so she may pick up on some of those personality traits that you love. But remember, each cat is an individual. Rather than trying to clone a cat’s personality and look, celebrate each new kitty for the individual that she is.